I saw this on my Instagram feed the other day and this could not be more true for not only myself but Steve and I. Those big life decisions or choices are only possible with your village behind you. For us, without our ‘village’ or personal cheerleaders we would have had a very different journey to where we are today both as individuals and parents. Our village stands beside me, it holds me up. Our village has supported us through quite a bit but we have been humbled at people’s love and generosity during my pregnancy and since Amelia was born. My family – As the first grandchild on my side of the family there was so much excitement. The love and support I received from my mum, dad and brother throughout the whole of my pregnancy made my journey into motherhood so much easier. I miss waking up to the eager messages asking what size she was now and what was growing and developing at what stage. From the moment they found out about Amelia, extra scan and feeling her move in my belly they have been with me every step of the way. My parents have shown us how to be the best for Amelia and continue to shower her, and us with so much love and support. Seeing my brother with Amelia makes me so proud to be his sister. She loves her Uncle Dan so much. Steve’s family – now these guys are my family. I have known the majority of the family for nearly 14 years so for me his sister’s are my sisters and his little brother is my little brother. 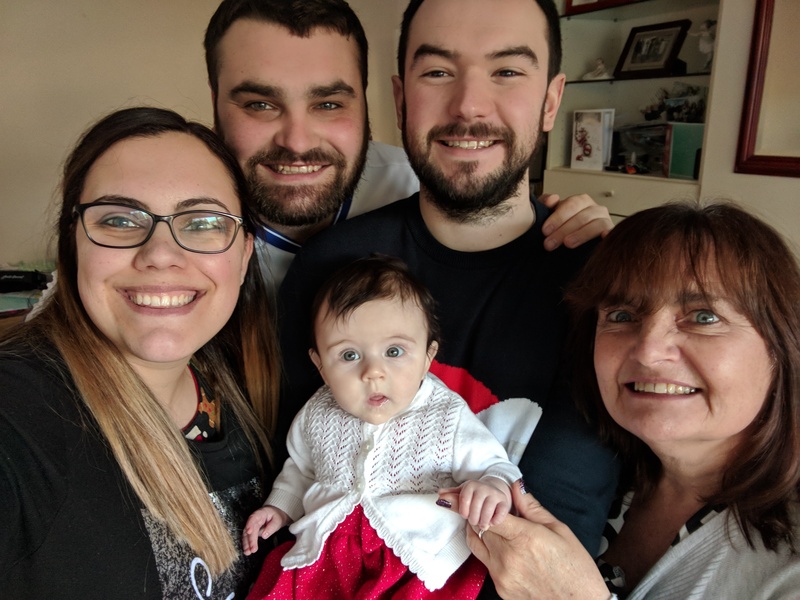 It’s not the first grandchild on this side of the family; Amelia is number 6! I absolutely love being part of such a big family and although it can be a little crazy with so many of us now it’s times that are so special. From lending us cribs to giving us highchairs, handing down lovely clothes or being on the end of the phone for advice they have all been there. Steve’s parents dote on Amelia like crazy and I just know that she is going to love Nanny’s Basangne (as my niece’s like to call it!) and Grandad’s crazy games! Steve and I count ourselves very lucky to have such wonderful families and extended families in our village. In those early days of pregnancy where we were worried something was going to happen to the day Amelia was born they have been holding us up, helping us to prepare and walking this journey into parenthood with us. We are so thankful that not only we get to have these great people in our lives but also that Amelia will too. My bridesmaids – these girls have been in my village for as long as I can remember and stood by my side when I married Steve. 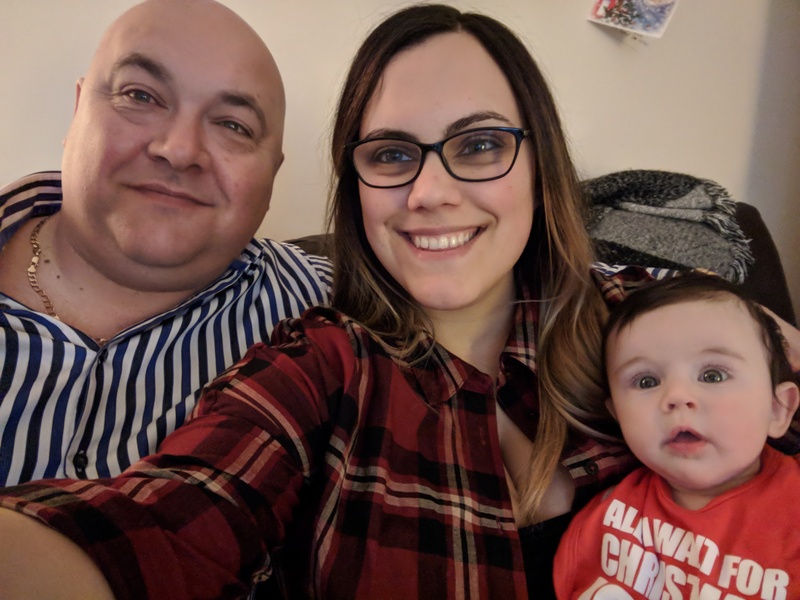 They were very much ‘Team Newbury’ from the start through dating, our engagement, buying our house so of course they have been there through my pregnancy and Amelia’s first month’s. I am so proud of each of these ladies for their own families they have started and amazing careers they have built for themselves. Throughout their busy schedules of work and family life they always have time for me and now for us a family. These guys are my personal cheerleaders. They know everything about me; the good, the bad and the ugly. They make me laugh and smile like no other and for Steve and I they are now such pivotal people in Amelia’s life also. I will be forever grateful for the care packages and time you spent holding me up in those first few weeks where I am not ashamed to admit it I struggled. You girls are my right arm and my happy place. Amelia is so lucky to have such amazing Aunties like you. My Star Girls 🌟 – Being such good friends from high school we really have gone through most things together and it was only fitting that I shared motherhood with my friend Hannah. Going through such a scary and exciting time with one of my best friends who I also worked with was so lovely. Hannah was 4 months ahead of me so it was really nice to be able to just go ‘is this normal?’. I know I could have done this any of my girls but knowing she had probably gone through it recently made her the best person to ask. We have been so lucky to be able to share motherhood and maternity leave together, and I know we have both lent on eachother for support which has been invaluable. My other stars have been so loving towards Amelia and I, coming over for cuddles and checking up on us as a family regularly. They say that if you have been friends for longer than 7 years then you’ll be friends for life; well these guys are my family. Katie (and Dave!) – it just goes to show that the people in your village aren’t always people you bring into there, sometimes they are connected to you by a friend or family member. For Steve and I, and especially me, Katie isn’t there just because she is Dave’s wife. Call it fate or whatever but this girl was destined to be my friend. I have had the privilege of being a witness at Katie and Dave’s wedding and a Godmother to two of their little girls. I just know that these guys are going to be such important people in Amelia’s life and will be there to guide her in everything she does. From handing down beautiful clothes and toys to putting together a breastfeeding goody basket these guys have been with us every step of our parenting journey so far. I am not going to sugar coat it; I found feeding hard. After feeding three children, Katie is so passionate about breastfeeding and it was great to be able to have her here for a support. If it wasn’t for her I would have almost definitely given up breastfeeding in those first few weeks. There are so many people not listed/named on this post that have been so generous with their love and support and this for Steve and I will be forever grateful. When becoming parents we knew that a lot of things would change but I think we both didn’t realise how much our village would grow.